Hydroe bramble in Bed of Fallen Leaves. Since this subject has no official name, the name Hydroe bramble is conjectural. Particularly, spoilers about a detail of the final boss in Hey! Pikmin. Hydroe bramble refers to weird green stalks with thorns that can be seen in some areas in Hey! Pikmin. These serve as obstacles that either block the player's path, or pose a passive threat, since they kill any Pikmin that touch them, and can hurt Captain Olimar. Each one can have a different behavior, between staying stationary, advancing and stopping, or moving in and out of place, and each one can also move in a straight line or a curvy pattern. Although their name and origin is never explained by the game, some facts hint that these these brambles are controlled by the Berserk Leech Hydroe. The plants become more common as the player approaches the later sectors. In the final sector (The Final Stretch) and area (Fragment of Hope), there are several of them, they try to attack the S.S. Dolphin II's pod as it flies away, they block the path behind Olimar, closing him in to the arena in front of him, and are also very quick and aggressive. Finally, the theme of the vines resembles the theme of the final boss. 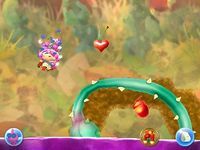 Several brambles at the start of Olimar's Madcap Ride. They do not retract, but instead, leave a small safe spot from which the player cannot escape. Bramble at the start of the area of the Berserk Leech Hydroe, Fragment of Hope. This page was last edited on February 22, 2019, at 07:31.